Prosperity Now’s annual Scorecard provides an overview of American households’ financial health. The Scorecard assesses the 50 states and District of Columbia on 53 outcomes focused on five categories: financial assets and income; businesses and jobs, home ownership and housing; health care; and education. The new data continues to show that Illinois has work to do to improve financial security for all Illinoisans, but particularly for Illinoisans of color. While Illinois sits near the middle of states in its overall Scorecard ranking, this average score masks significant disparities in outcomes between white residents and residents of color. New to this year’s Scorecard is a racial disparity rank, which highlights how wealth and financial well-being is not equally shared amongst people of different races. In Illinois, racial disparities exist for all 26 measures. Racial disparities exist for all reported outcomes. Key findings from this year’s Scorecard show us that many families in Illinois do not have financial security. Illinois families are ill prepared to handle a financial emergency. Three in 10 households would not have access to sufficient resources to put food on the table, pay their rent, and cover their car payment if they experienced a loss of income. 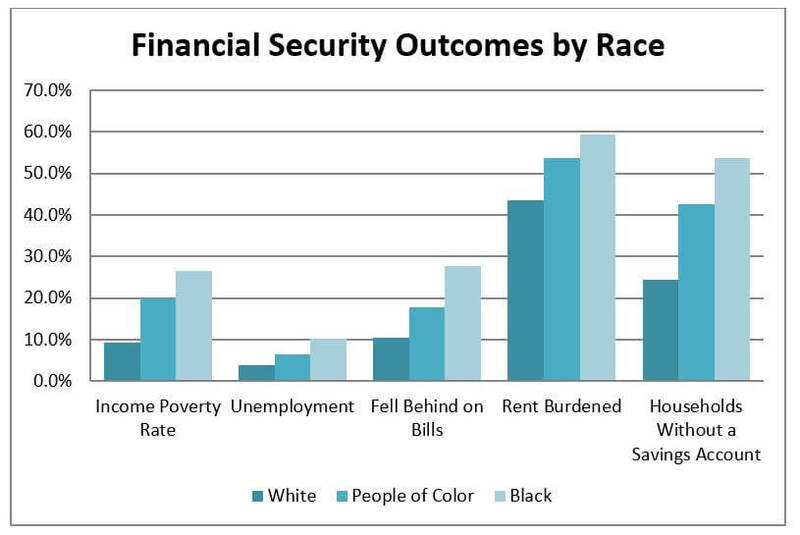 This number doubles for black households, where 6 in 10 families experience liquid asset poverty. Illinois continues to have one of the highest bankruptcy rates in the nation. Illinois ranks 47th in the nation for our bankruptcy rates. Bankruptcy often stems from a financial emergency, which may start as a parking ticket, job loss, or illness resulting in increasing debt. In Illinois, our debt collection practices can push more Illinoisans into filing for bankruptcy as Illinois law does not adequately protect individuals’ homes, vehicles, or bank accounts from debt collection. The richest 20% of households in Illinois make five times as much as the poorest 20% of households. Wages have continued to stagnate for low-wage earners, and 1 in 5 residents has a low-wage job. Low-wage work puts families in a challenging financial position, where they may be unable to meet their basic needs or find they are one small emergency away from falling into poverty. Illinois has not taken steps to ensure that all workers are paid a living wage. It is clear from the Scorecard data that Illinois needs to improve the financial well-being of its residents. Out of the 28 policies recommended by Prosperity Now to support financial security, Illinois has enacted less than half of them. However, it is clear that racial equity drive any policy or programmatic changes. Any actions taken to improve the financial security of Illinois residents must also work to close the racial wealth divide. In the 2019 legislative session, legislators should prioritize increasing the minimum wage, capping interest rates on predatory title loans at 36%, reforming our debt collection laws, and passing legislation to create a statewide Children’s Savings Account program. Check out our policy agenda to learn more about policies we’re advancing to close the racial wealth divide and help all Illinoisans thrive. To learn more about the Scorecard, take a look at Illinois’ 2019 Scorecard Profile and read Prosperity Now’s main findings.